There has been a reclassification to the listing of Yr Uchafion instigated from analysis of LIDAR data by Aled Williams and subsequently confirmed via a survey with the Trimble GeoXH 6000. Yr Uchafion is the draft title for a list of the Welsh 500m P15s that takes in all hills in Wales at or above 500m that have a minimum drop of 15m, the list is a joint compilation with Aled Williams, with the details relating to this list being published on the Mapping Mountains site in November 2015. The listing of Yr Uchafion includes three sub lists; the 500m Sub-Uchaf, 490m Sub-Uchaf and the Double Sub-Uchaf category. The reclassification of this hill is from 500m Sub-Uchaf to Uchaf, with the criteria for 500m Sub-Uchaf status being all Welsh hills at or above 500m in height that have 14m or more and below 15m of drop. 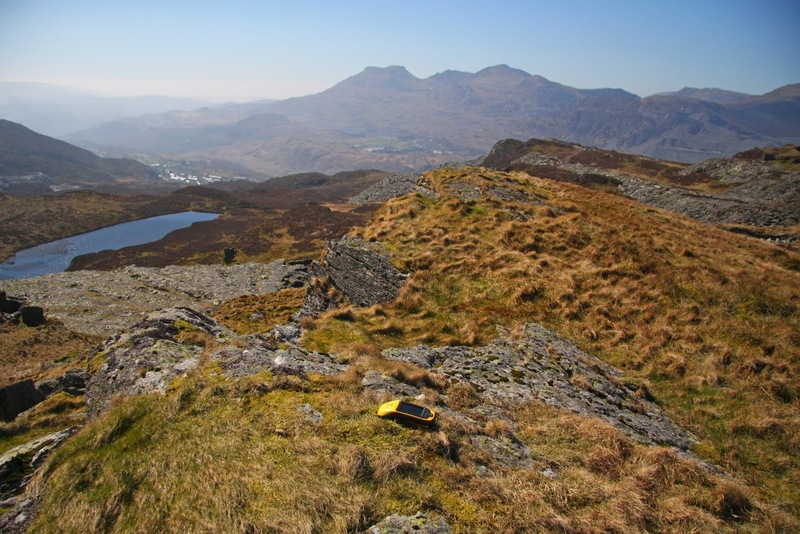 This hill is given an uppermost 520m ring contour with no spot height on current Ordnance Survey maps and has bwlch contouring between 500m – 510m, and prior to the analysis of LIDAR data the hill was listed as a 500m Sub-Uchaf based on a basic levelling survey conducted by Myrddyn Phillips on the 27th October 2005, which resulted in a drop value of 48ft 6˝ (14.8m) which was insufficient for it to qualify for Uchaf status. The hill is adjoined to the Arennig group of hills with its Cardinal Hill being Manod Mawr (SH 724 446) and is placed in the Region of North Wales (Region A, Sub-Region A3). The hill is situated with the town of Blaenau Ffestiniog to the west south-west and is positioned between the small mountain lakes of Llyn y Drum Boeth to the north-west and Llyn Du Bach to the south. The hill can be accessed via a track that follows the course of the Afon Teigl from above Llan Ffestiniog or via public footpaths from Blaenau Ffestioniog, however current mapping shows that the summit of the hill is not on open access land, although being close to it, and on a previous visit the land between each is open and unfenced and therefore hard to distinguish where the open access land ends, in situations like this common sense should prevail and if wanting to visit the summit there is likely to be no objection to doing so. The name of the hill is Drum Boeth and its reclassification from 500m Sub-Uchaf to Uchaf is due to analysis of LIDAR data by Aled Williams. LIDAR (Light Detection & Ranging) is highly accurate height data that is now freely available for much of England and Wales. Therefore, the 523.4m LIDAR data produced for the summit position at SH 72020 46289 and the 508.3m LIDAR data produced for the bwlch position at SH 72161 46335 gives this hill 15.1m of drop, which is sufficient for its reclassification to Uchaf status, with the details from the Trimble GeoXH 6000 survey being 523.4m (converted to OSGM15) summit at SH 72020 46289 and 508.1m (converted to OSGM15) bwlch at SH 72159 46335, giving this hill 15.2m of drop. This now brings the overall total for Yr Uchafion / The Welsh 500m P15s to 629 hills with the overall total for the 500m Sub-Uchaf category now being 25.